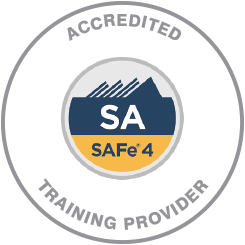 Leading SAFe 4.5.1 London, Birmingham, Leeds, Edinburgh and UK locations. Use SAFe for better results in a Lean-Agile enterprise! ﻿﻿Want to leverage the Scaled Agile Framework (SAFe) to lead a LeanAgile enterprise? In this course, you will learn about the underlying SAFe principles originating from Lean, systems thinking, Agile development, product development ﬂow, and DevOps. These processes will benefit the planning and execution of PI Planning events, and as well as managing multiple Agile Release Trains (ART). There’s also valuable insights into how to build and support Agile teams and programs, strengthen a Lean portfolio, introduce a Continuous Delivery Pipeline and DevOps culture, and more. Executives and leaders (Managers, Directors, CIOs, VPs, etc.). Development, QA, and infrastructure management. Product and product line management. This course can be undertaking by anyone looking to improve and accredit their SAFe leadership skills ability. However, it is recommended that you possess 5+ years of software development experience, and/or involvement with Scrum, testing, business analysis, product, or project management.